Do you want to taste something different? – A mixture of opposite flavors. That’s the melted cheese with peppers. A recipe that mixes 2 very different ingredients. On one side is the strong, elaborated and spicy flavor of the peppers and on the other side is the fresh and soft flavor of the cheese. When these ingredients unite they form a very special flavor that you have to experience . This melted cheese is normally served as appetizer. Although if you can tolerate the peppers’ hotness, then it can be eaten as main course. In Mexico this dish is eaten by making melted cheese tacos with flour tortillas. A True Delight! To make this dish you will encounter a very laborious process with the peppers, then everything is easy. It is very important to use some cheese that melts like the Chihuahua cheese, the Asadero cheese or the Monterey Jack cheese. If you buy the cheese grated you will save a step. If possible serve the cheese in a small clay cazuela it will look divine. The melted cheese will be ready in 20 minutes . The recipe for 6 tacos with cheese and peppers. Cut into strips the Poblano pepper with the one you worked and reserve. Incorporate in the frying pan the strips of the Poblano pepper that was cut and fry them for about 3 minutes, until they are moderately fried; stir regularly. Then set aside. Transfer from the frying pan to the baking dish the peppers that were fried. Heat on the griddle over medium heat 6 flour tortillas for about 45 seconds per each side, until they are well heated. 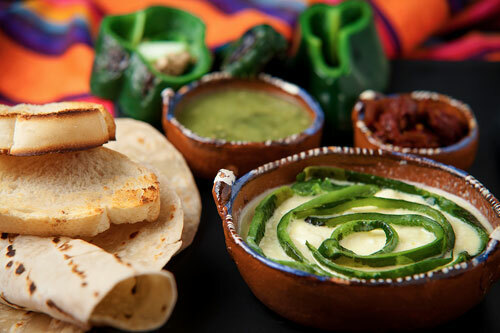 Tip: Give an extra touch of flavor and freshness to your melted cheese with a salsa. Did you like the Cheese with Peppers? Change your old grater for the “Cuisinart Grater". It is made of stainless steel, it has 4 sides to grater and the plastic molding on the base keep it firm while you grate. This is a beautiful clay cazuela that you can use to present the melted cheese in an extraordinary way. Get the weight of the food that you cook to perfection with the “EatSmart Precision Pro". It can weigh up to 11 lbs, the weight is given in 4 different units and it eliminates the weight of a plate, bowl or other items that you don’t want to weigh.